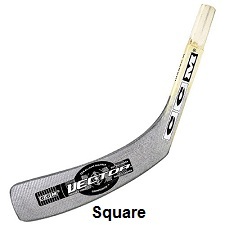 I hear a lot of requests on hockey forums like modsquad hockey and the rink on hfboards.com about the curve of a hockey stick. Questions like “what is the best curve for shooting”, “what is the best curve for a toe drag”, “what curve should I use for saucer passes, or to score more goals”. I thought that it would be great to have a detailed guide to the curve, so hockey players could decide which one is best for them. Luckily I found one published on the physics of hockey website. The Author, Alain Haché was kind enough to let me post the article here on How To Hockey. Another great resource are the blade pattern charts on Hockey Monkey. They update the charts each year with the current manufacturer blade patterns so you can better understand what you will get with each curve. Read the article below to understand what each part of the blade will do for you, and then select a pattern from the charts. Next there is the “loft” or “face” of the blade. The loft is the tilt angle of the blade; you can see it when holding the stick normally and looking from the above. A blade that tips backward is said to be more “open faced”, very much like a 9 iron is compared to a 3 iron in golf. 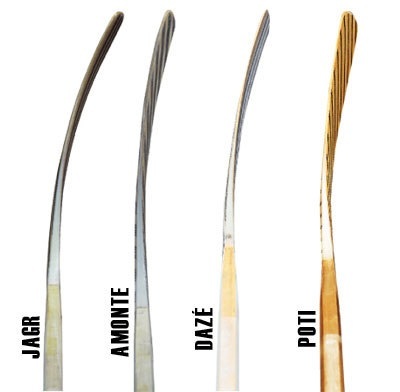 For example, notice in Figure 1 how the “Poti” blade has more loft than the “Jagr” blade. As in golf, the more tilt a hockey stick has, the easier it is to lift the puck up. If blades have a heel they also have a toe. The toe is the very end of the blade, and it comes in two basic shapes: round and square, as Figure 4 shows. The difference is that a square toe offers more blocking area and the round toe gives more puck control at the tip. Finally, the “lie” is the angle the blade makes relative to the shaft. It’s is measured as a number between 4 and 8 and printed in front of the shaft (most curves for senior sticks are between 5-6 lie). With a proper lie, the bottom of the blade is flat against the ice when the player is holding the stick normally. How does the curve affect shooting? Consistency: the curve effectively forms a pocket at the bottom of which the puck will tend to go. When the puck leaves the stick always at the same place, the player passes and shoots more consistently. Control: it’s easier to scoop the puck and take it quickly around an opponent with a curved blade. Other tricks are also made easier, like grabbing the puck at the tip of the blade and shooting it upward all in one move. Spinning gives the puck more stability, like a football. In a “saucer pass”, spin is especially important because the puck must land flat on the ice. Although it is technically possible to spin the puck with a straight blade, it can be done better and more consistently with a curved blade. Applying cloth tape to the blade also adds adhesion and helps the puck spin. Spinning the puck is also done by goalies, and indeed most of them use slightly curved sticks for that purpose. What about the negatives aspects of a curve? What helps the forehand shot hurts the backhander, unfortunately. 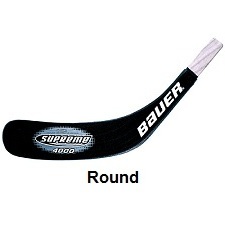 Some accuracy is lost in that respect, but considering the popularity of the curved stick in the NHL, it seems that the benefits win over the drawbacks. The reason why the NHL sets a curvature limit is probably to avoid excessive puck control. Can you imagine blades shaped like half-circles? Just grab the puck and go! Some argue that straighter blades are safer because they tend to keep the shots low. Deeper curves means easier upward shots, but the loft is probably the more important factor, especially in a slapshot where puck control is limited to a very short impact time. When the league decided in 2006 to increase the limit from ½ to ¾’’ (at par with the International Ice Hockey Federation), some goalies and defensemen expressed concerns about flying pucks. Their concerns may be justified if the new rule allows for more loft than before. However, according to the rule statement, it is not clear whether the “point of maximum curvature” is taken anywhere on the blade, not just at the bottom. If so, the new rule will allow players to put more loft (or twist) on their stick, making high shots more likely. What curve should you choose? Now that we understand blade curve basics, how should you decide on your next purchase? If you’re an experienced player you won’t need advice, as you already know what works best for you. High-level players select their stick based on their position (defense or forward) and on what type of curve they are accustomed to. Beginners, on the other hand, don’t need to go into the nitty-gritty and should select a curve that is neither flat nor overly bent. Buy what feels right, and as you get used to the stick, you might develop a preference for it. After all, an accurate pass, a hard slap shot and good puck control is above all a matter of practice and skills. But of course, don’t forget to blame your stick for misfires. If you are ready to select a curve pattern check out the blade pattern charts on Hockey Monkey. You should also check out their clearance section while you are there! You might find some great deals on sticks. Big thanks to the guys at the physics of hockey for this article. Check out their website for more cool hockey articles. When I was started to play hockey, I joined in sports institute. My coach suggested Hockey Monkey and coupons from Dealhack for me to buy equipments. With these, I got benefited and bought all things on budget. Thanks. Thanks for posting this! Helping my science fair project like nothing else! I use the hall curve and i find it the best curve. I use the hall curve and i find it has the best curve. That is good and all, but everyone is different. What may work best for you might not work for someone else. Hi , I am looking for a solution to my problem . i play ball hockey and i want a stick that can get off the surface with my shot. i tried 1 of my friends stick and i just shot and it went high and thats what i want! Thanks , im pretty sure it was the crosby curve but i need to know ! Doyle, I use a Warrior stick with a Kovalev curve. Its a open face lie, heel curve. I have to try and keep the puck down. Is there a specific curve that will help me get the puck off the ice? Ovechkin curve, its crazy open face makes it easy for beginners to lift but it takes a lot of practice to use it and have good control over the puck like shooting low with it. It took me sometime to master the curve and be able to snipe with it. I was told loft of a stick had to do with more the angle of the blade and shaft when holding the stick on the ice in one hand. I once to thought lie had to do with the face but as far as I can tell from bauers and eastons blade charts they describe the face angle in words such as closed,open,slightly open, wedge or medium wedge. Hi Jeremy, just curious what kind of curves and lies do you prefer? Thanks for posting this in-depth article. This is great in-depth info. We did a quick overview on blade patterns awhile ago, there is certainly more to it than just grabbing the shiniest stick of the shelf, that’s for sure.